Conflicts of interest have become more the rule than the occasional exception. Even the trusted US Centers for Disease Control and Prevention (CDC) receives heavy funding from industry. Is the CDC Protecting the Private Good Rather Than the Public? “Public-private partnerships allow CDC to do more, faster. The agency’s core values of accountability, respect, and integrity guide the way CDC spends the funds entrusted to it. In other words, the CDC believes, and “assures” you, it has the moral backbone to do the right thing, despite the fact that studies have revealed moral fiber tends to significantly deteriorate as soon as a funding source with an agenda starts doling out money. Moreover, a 2009 investigation by the Office of the Inspector General concluded the CDC has “a systemic lack of oversight of the ethics program,” noting 97 percent of disclosure forms filed by the organization’s advisors were incomplete, and 13 percent of advisors didn’t file one. Did Industry ‘Buy’ CDC Recommendation for Expanded Hepatitis C Screening? External funding to the CDC in the form of industry “gifts” was authorized in 1983—nearly 40 years after the organization’s inception in 1946. After the passing of legislation in 1992 that encouraged relationships between the CDC and industry, the non-profit CDC Foundation was formed in 1995. Last year, this Foundation received $12 million from private corporations, and the CDC itself received another $16 million in funding earmarked for special projects from companies, manufacturers, and various philanthropists. “For example, in 2012, Genentech earmarked $600 000 in donations to the CDC Foundation for CDC’s efforts to promote expanded testing and treatment of viral hepatitis. Genentech and its parent company, Roche, manufacture test kits and treatments for hepatitis C,” Lenzer writes. Since 2010, when the CDC and the CDC Foundation formed the Viral Hepatitis Action Coalition, manufacturers of hepatitis C tests and treatments have donated more than $26 million to the coalition. In addition to Genentech, donors include: Abbott Laboratories, AbbVie, Gilead, Janssen, Merck, OraSure Technologies, Quest Diagnostics, and Siemens. Two years later, in 2012, the CDC issued guidelines recommending expanded screening for hepatitis C for everyone born between 1945 and 1965, saying newer antiviral drugs can effectively halt disease progression. However, “the science behind cohort screening has been challenged and is said to be ‘the subject of major debate.’ The scientific debate along with the price tags of the newer drugs (over $84 000 per treatment course for the new drug sofosbuvir), raise questions about CDC’s industry funding,” Lenzer writes. 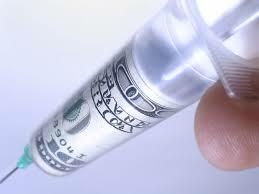 The CDC and the CDC Foundation also received monies from Roche for the creation of the CDC’s “Take 3” flu campaign, again raising questions about the influence of funding on its drug recommendations. Genentech, the manufacturer of the controversial and dangerous influenza drug Tamiflu, is a member of the Roche Group. The problem with that, Lenzer points out, is that the CDC describes this study as “independent,” when in fact it was sponsored by Roche. Moreover, all of the four authors have financial ties to Roche, Genentech (both of which sell Tamiflu), or Gilead (which holds the patent). In addition to that, the CDC did not include last year’s systematic review3 of 83 trials conducted by the Cochrane Collaboration, which is the “gold standard” for independent research analysis. Was this analysis ignored because it concluded Tamiflu alleviates symptoms of the flu by less than 17 hours, has limited effect on your risk of pneumonia, no effect on adult hospital admissions, and causes nausea, vomiting, headaches, renal problems and psychiatric syndromes? Another issue is this: CDC director Tom Frieden has stated that taking Tamiflu might save your life, yet the US Food and Drug Administration (FDA) has warned Roche it cannot claim the drug reduces pneumonia or deaths as they’ve never produced any evidence for that claim. The BMJ, “This looks like classic stealth marketing, in which industry puts their message in the mouths of a trusted third party, such as an academic or a professional organization,” Lenzer writes. The Food and Drug Administration (FDA) has also become notorious for its conflicts of interest and close ties to various industries, and there are many examples of this. FDA researchers found low levels of inorganic arsenic in the livers of chicken who consumed the drug. Correspondence between Heidi Chen, then attorney in Pfizer’s animal health division, and William Flynn, the FDA’s deputy director for science policy at the Center for Veterinary Medicine, reveal the agency allowed Pfizer to edit the wording of a press release about the roxarsone data, and more. Getting back to the CDC, it was created and has been relied upon as anindependent agency without industry ties that might muddy the water in terms of the health and safety recommendations it issues. Now, it’s become apparent that not even the CDC can be counted on for unbiased science-based advice. So what, if anything, can be done to rectify the situation? Considering the fact that CDC funding from industry was approved by the government, the answer, as noted by Jerome R Hoffman,6 methodologist and emeritus professor of medicine at UCLA, is to “get the government to reject this devil’s bargain, by changing the rules so this can no longer happen.” It’s simply unreasonable to believe that any organization will ignore its cash cows, and it’s equally naïve to believe that industry will continue donating money if the agency decides to do anything that even hints at cutting into industry profits. The infamous revolving door between the government and the drug industry is another factor that has done an awful lot to destroy scientific integrity and government accountability. One classic example is Dr. Julie Gerberding, who headed up the CDC—which among other things is charged with overseeing vaccines—from 2002 to 2009 before becoming the president ofMerck’s vaccine division, a position she currently holds today. The influence her former high-level ties to the CDC wields is enormous, considering the fact that Merck makes 14 of the 17 pediatric vaccines recommended by the CDC, and 9 of the 10 recommended for adults. And while vaccine safety advocates are trying to rein in the number of vaccines given to babies, safety concerns keep falling on deaf ears. The vaccine industry is booming, and it’s become quite clear that profit potential is the driving factor behind it. It is this type of reprehensible and inexcusable behavior that makes it an enormous challenge to change this seriously flawed paradigm. Many industry-funded studies with negative findings simply never see the light of day, as suggested by a recent NEJMreview14 looking at compliance rates with results reporting at ClinicalTrials.gov. The Food and Drug Administration Amendments Act (FDAAA) mandates timely reporting of results of applicable clinical trials to ClinicalTrials.gov, but only 13.4 percent of trials reported summary results within 12 months of completing the trial, and 45 percent of industry-funded trials were not required to report results. For comparison, only six percent of trials funded by the National Institutes of Health (NIH) and nine percent of studies funded by other government or academic institutions were excluded from result reporting. A recent article16 in NEJM titled “Understanding Bias — The Case for Careful Study,” offers a discourse on bias, at the core of which you find financial conflicts of interest. But there are also a number of other hidden, largely subconscious conflicts within any given individual that can color his or her decision-making, such as how easy one treatment is versus another—one might require hours of work, while the other would allow the doctor some well-needed sleep. Have you ever asked your doctor if a certain drug was right for you—as instructed by virtually every drug ad you see on TV? Clearly, this ploy works, or the drug industry wouldn’t spend $4.53 billion a year on direct-to-consumer (DTC) advertising.20 In the midst of all the faux science backing up recommendations to use drugs of all kinds, the Food and Drug Administration (FDA) is considering simplifying DTC print ads by making the manufacturers summarize potential side effects in layman’s terms—and omitting certain drug details altogether. Cutting the laundry list of side effects from radio and TV ads is also under consideration, ostensibly to improve your understanding of the drug’s risks. It’s difficult to discern whether a change like this might actually change how consumers “hear” or “see” the benefit versus risk potential of any given drug. In my view, the most reasonable approach would be to dramatically reduce or ban DTC drug ads altogether, as they do absolutely nothing to improve public health. On the contrary, luring people into thinking they might benefit from a drug is a recipe for disaster, as it reinforces the fallacy that there’s a magic pill for every ill, when in fact most ailments can be effectively prevented or addressed with inexpensive lifestyle changes that have no detrimental side effects whatsoever. History is replete with examples of drugs causing far more harm than good. Vioxx is one classic example. It killed about 60,000 people before being withdrawn from the market. Most recently, Takeda Pharmaceutical has agreed to pay $2.4 billion to settle some 9,000 lawsuits from patients who developed bladder cancer from the drug22–a side effect the company concealed, according to plaintiff attorneys. Despite such risks, Actos is still sold in the US and other countries. Hopefully, you will resolve to take control of your health and avoid becoming a statistic of a conflict-of-interest-driven system that places greater value on share holders than patients. Addressing your diet is an obvious place to start, along with a regular exercise program.